Outside of the throne room Inarius knocked on the door with his right hand. It held his scar from his abuse of magic as a child. This was the ruler of the light and wanted to find the reson for her fighting for the light.It was obvious but he wanted to get more detail.He was always thirsty for knowledge. The hallway outside of the throne room was magnifacent. It was carved with beautiful engravings of angels that didn't really intrigue Inarius just because that type of beauty was not his thing. He waited his eyes constantly shifting looking at the engravings looking at the differences between them. They were slight differences but noticable. Since he wasn't paying attention when he heard a voice from the other side of the door he thought he allowed to come in. Looking at the ground as he entered he sighed as he said "I am Inarius, The master Illusionist, Ruler of Illusionary forest." He said looking at the carpet looking at the carpet leading to the throne.He was slowly following the carpet. He would not even see the ruler before he/she replied. He believed the ruler would be a male by the way everyone talked about him being extremely fast.Nost likel the fastest angel there was. He was the fastest demon so they had something in common.But he would be surprised by the amounts of differences they would have. Kirux stood up a smirk on her face. Inarius...Just why was he here to speak to her? The two weren't exactly friends. 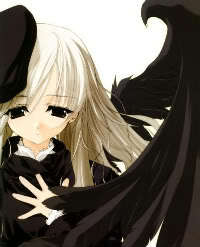 The angel stretched her black wings and walked towards him, the feathers grazing the carpet ever so lightly. She walked up to him, her guards at the walls twitching slightly for the proximity she came to the demon, before stopping and waiting. "Hello Inarius. What business do you have here? I suspect you are not here for battle, if you keep in tune with your senses." The female angel turned, her eyes still on him as she walked to the right side of the building, to a door that lead to a library, few guards were allowed there. Kirux trusted her guards, but for the guest, she felt that privacy would be much more comfortable. She tilted her head so that her emerald eyes could watch him, and she waved her hand at him, gesturing to follow. Her hand rested on the handle of the door in patience, and she looked to a guard standing by her, and nodded. He knew that he was to wait outside, unless any unusual noise were to arise. Even if a fight was to break out between the two leaders, she wasn't exactly fond of guards joining in. It wouldn't be a very wise choise of Inarius, for he was in the stronghold of the entire forces of light army. He didn't even possess wings. A smirk was suppressed from her features, and she turned back, the black strip of material that wound tightly around her torso remained unmoving. Her stomach was left to the cool air, which, no matter how much light she recieved, it always stayed pale. Much like her fair hair that spilled down her back to her waistline. At the bottom, around the small of her back, a bow that matched the color of her eyes held her hair together between her ebony wings, to manage it easier. "Is it so weird to just come and say hi?" Inarius said.Not really surprised about her appearance it fit her description perfectly. She apparently knew that he wouldn't say with the guards around. As she walked into the library he followed her. He understood what the gesture meant it wasn't a complicated one. As he entered the Library he awaited for her to let him sit.It was her kingdom and it would be rude to act if this was his. "Hm, I see you are quite wise. So I'm guessing your a century old? You have been ruling this world for quite some time." Inarius said making small talk. "Well here's the real business, I want to see your view of the war.Your reasons for fighting the dark. If you wouldn't mind telling me, I want to evaluate the position you are in. Don't get me wrong I'm heading toward the Dark kingdom after this.I came here first because I know you won't attack without a reason unlike the darkness." Inarius paused averting his eyes continueously looking at the books. He most likely never read any of these books. He then looked back to the queen. Looking at her in an intrigued manner. He was waiting for a response. He wasn't going to lie to himself he admitted she was most likely faster than him for he never thought highly of himself. But he wouldn't say that to anyone else besides her, and only when she gained his respect friendship as a friend, not just as a leader which she already had. "By the way I'm not here to battle you, I don't hit girls..." He said with a fake smirk at that end.He would've acted more demonic if around shinji or senlou but he could never act that way towards girls. That was his weak spot emotionally. Kirux held the door open for the illusionist, and nodded once when he glanced at her before passing through the door. She then followed him, and closed the oak doors, before spinning around to face him. She continued until they were at a wide desk, random books opened and others piled. She spent a lot of time reading history. It was good to know backgrounds when living in these times. She merely nodded to him when he spoke of her ruling. She hasn't ruled for long, only since the invasion, however, she let it slide. The queens attention flickered to him when he spoke of his business here. Obviously about war. She stretched her wings and leaned back, a soft smile on her features. She wasn't fond of war, no matter how much she loved fighting. She preferred peace, because not every person in the world was a fighter. "My view of war...Well...I don't particularly enjoy engaging war because then it puts my people in danger, as you are sure to know. I fight against the darkness because they are becoming too modest, and are falling out of line. They're killing the innocent. I cannot stand for that and allow them to kill of my people for their own selfish needs and pride. I don't know your choice, but I'll respect it either way. Maybe bribary is what you prefer. If I was in your position as a neutral, I'd stay out of war. It only causes misery and destruction. Useless killing. But you are right. We will not be the ones to attack you out of spite." She told him honestly, her emerald eyes keen on him. She examined the Illusionist, trying to judge what he was thinking. It was true that his question suprised her mildly, however, it is to be expected in these times. She couldn't understand why he'd put his people in danger. A young, prideful leader she suspected. The hero of his people. He belonged in his army, a leader, she was not sure it was so wise. The female didn't judge him upon his question though. It may only be to gather information, for reasons behind it all, because the truth could have been clouded. The angel was unsure. She surpressed a frown when he said he didn't hit girls. Gender always seemed to make a difference when it came to fighting. The boy seemed quick, however, she was sure she was more agile than him. He didn't seem very strong either. He was rather small, larger than her of course, but for a male...It was odd. She was never really taken seriously in a fight. Kirux supposed that was an advantage. He watched her as she leaned back and noticed a subtle smile.As she leaned back Inarius listened intently looking her directly in the eyes. He found her answer completely reasonable and her facial expression no signs of deceit. Inarius decided since she had given some information to him that he would give some back. "Sorry if I sounded rude or offensive when I said I didn't hit girls, what I meant was I never would start a fight with a girl. My sister had barely escaped an attack so-" Inarius paused his eyes now turning red from the thought of not being able to protect his siter. His eyes showed off a depressed expression but he was truly just angry at himself. "Don't worry I was planning to stay neutral, I believe killing foolishly is just that foolish." Inarius was confused by the last remark where she said bribery might be his style. "No bribery is not my thing...and noone can ever truly stay out of war. There will be those who try to concur the neutral worlds for more power and a chance to turn the tides." Inarius eyes had turned back brown and he had a slightly more happier appearance which was not really how he was feeling but couldn't help not looking cheerful. He had not been as observant today and had just noticed her scrawniness was more than his. Most females that he had met were taller and probably weighed more even if not by much. He found someone that was around his age that was actually smaller which was a surprise.He didn't say anything or change expression because that might sound offensive. "And now on nonpolitical terms, how's it been?" He said. Finally taking his hands out of his pocket and taking his traveling jacket off. He revealed his scar that was a symbol of a black dragon on hia right arm. "Since you answered my questions I'll be willing to answer nonpolitically, or politically if you have such a question...it would only be fair." She shook her head with her eyes closed, brushing off what he said about females. She opened one eye when his sentence stopped abruptly, and then the other eye opened, their vibrant green examining him. The color around his pupils melted into a crimson color, and her fingers twitched over to her daggers. He was a master of illusion after all, and she automatically prepared herself. Oddly enough, sadness filled the air, cold, quiet. She watched him closely, her fingers around the hilt loosely. He changed the subject abruptly, back to what she was speaking about. She nodded, and stood up, her eyes turning to the window, her winged back towards him. The windows were large and covered the entire side of the building, overlooking a sunset, back dropped by orangy clouds, her white city shimmering. "I did not suspect whether or not you took bribery as an advantage or not, but I'm relieved of your choice. And anyway, if a side of a war tried to take you up for help, I'm sure that they would not cause harm to you, in fear that you would oppose them out of spite." The female twisted to see his expression, and grinned at him in an odd manner, almost violent, coming from the angel of light. She noticed his eyes resigned to their original color and that he seemed to be happier. A mask, she supposed. She looked back out the window, but felt his eyes on her. Kirux chose to ignore it. His next question surprised her, and she spun around slowly with the sound of movement. The was merely removing his jacket, exposing a scar on his arm. Her eyes flickered away from it in less then half a second, and she nodded to him. "Everything has been fairly well. One of the families I spoke with today gave me a few ideas for a party, you know, to keep people at ease. I was considering it. The only fear I have is that since everyone will be in one place, it would be easy to take everyone out. Of course I didn't say that to them, but...That's part of being a leader though. You feel like a parent of everyone. Making sure they are all okay. Besides, a little partying might do these guards good." Kirux told him, winking. All of them were uptight, nervous. Little fighting has been going on lately, and the suspense was building on them. It made their fighting shakier, and their moods terrible. As he watched her turn toward the window he could not help but feel inrigued by this conversation. Usually all the monsters he held off in patrol could never, mystify him this much. He had never really found someone he could talk to in such a way. He saw her turn with a somewhat violent way. He raised an eyebrow wondering why she had done this. He never let his eyes off of her. He knew he could trust her but it was habit of him to never let his protective layer down. He listened as she talked about if she was wondering bribery was an advantage for him. He did not really understand what she meant, he understood the basic meaning but was trying to discover a meaning behind it. As she turned away and resumed looking back to the sunset he said "I doubt people would fear me" Inarius said replying to the statement she had said. He never found a reason for anyone to fear him, he believed himself fair, he never killed the innocent and usually spared the guilty. He noticed a flicker from her eyes as she turned around quickly, showing some of her speed. Truly the fastest person he had ever met, even if it was just from a simple turn. The direction of the flicker was at his right arm. After all his scar was noticable and yet he didn't find it a problem with looking at it. It was a natural response for living beings. Curiousity is what allowed humans,demons and angels to exist. He listened intently on the 'party' idea that the citizen had mentioned to her. "I'd be willing to come if you'd like if you wish to pursue that Idea. I can gather some of my mages to create magical barriers protecting the area from enemies." Inarius kindly said "And do not worry I'll leave right after with my men, if you want me to. But I would have to allow one of my men to stay if not me to see if the barriers would hold up properly." Inarius took a small breath. "I'm just trying to help out a friend" He said. He knew that people needed a break from everything. He kept on looking to her eyes everytime she turned. He never gave angry or depressed looks, they were always looks of a friend that was there to help. "You do need a break yourself as well, you have to rule your people and always carry the stress of there lives on your shoulders so maybe the party would do everyone good" He gave with a small smile. He always liked to help people, that was one of his likeable attributes that made him a good friend. But unfortunately growing up, noone ever knew him well enough to know. "So what do ya think about that idea?" He asked curiously. Kirux shook her head, the pale blond hair framing her face shifting across her cheekbones. "Well, people may not fear you directly, but they will fear your decision, if you ever choose to come into battle. I even fear your decision." She admitted, her face calm. From his expression, she could tell that he noticed her glancing at his scar, and the slight curiosity in her eyes. It indeed was an odd scar, so distinctly designed into the shape of a dragon. She assumed some type of magic or branding, because no blade could have the time to etch it into his skin so nicely. She grinned when he spoke about the party. His barrier idea made sense, and she pondered that idea. Her eyes watched him closely, analyzing him for any deception. She spotted none, but that didn't give her an answer to it just yet. She would have to speak to people about it. The female smiled back at him, and nodded. "Well it sounds like an amazing idea, but I would have to speak to people about it. Judging from now, I could not give you a straight answer. It sounds harmless, yet again, you are the master of illusion, no?" Kirux raised an eyebrow at him, her lips curled upwards at one corner. She came back from the window and sat down at a chair opposite of him and leaned forward, propping her head up onto her elbows. Faint scars could be seen on her skin as well, but only in certain lights. As the two leaders probably already knew....War takes a toll on everyone. "Really?" He said with the battle remark he never believed anyone would fear him. Maybe because of his military's strength, he did not know. He found it odd that he played such a factor in this world. But what else is to be expected when you rule a world. Looking at her with his eyes steady and soft, he was relaxed to be in a comfortable environment. Relaxing on the chair slightly rocking back and forth but not so far to make him fall he listened to what she had to say about her people's decision. It was obvious she was going to have to go over it with her people but an unexpected question cam from her. "Yes I am The master, but I rarely use my Illusion to trick people. Words alone could do that. I also prefer to use Illusion for defense not offense, that is why I also specialize in speed. But that is a different matter. It is okay to refer to your people for the decision, they are the ones who may be endanger if I am not trusyworthy. But yet again I am surrounded in your palace. I could most likely keep you from killing me for a while but then there would be the guards interferance overall causing my demise." He paused still looking at her barely blinking. He stopped rocking the chair and just looked at her as if he was in thought. But this was only for a second. "And besides You have the capacity to break out of any Illusions I may put." He just continued to look at her after his analysis you could say. He was curious about her response over her actions, for she was obviously not going to show any...odd movements to someone with his knowledge and analyctic skills. He noticed light scars on her face, but they were nowhere near close to his dragon scar noticability. After all the scar was pitch black on his tan skin, not exactly unnoticable. "You could go ask your people now, and have gaurds watch me wherever you please. It would be purely precautionary for you, so I'd understand" He said as his final statement. Kirux nodded, and watches him speak, of what seemed the truth about his illusionist skills. He froze for a moment, causing her to catch her breath, listening for anything beyond the ordinary. Nothing seemed to be different and then he started back in motion then, speaking of her skill that he judged her by. The female nearly shrugged, and tilted her eyes away, to the reflections of the lasting sunlight into the room. It wasn't often that she had visitors that were so kind, most were borderline hostile, and others rude. Her muscles were slowly unwinding, a much more relaxed posture replaced her rigid spine and shoulders. Even her wings folded loosely along her spine, and ceased their faint shaking from stiff muscles. The queen was finally starting to feel much more comfortable around this person. Her emerald eyes flickered back to him after a moment, and she briefly nodded, rising from her seat. She took a moment to step gracefully around the desk, and over to the door before turning around to face him. "Would you like to join me, or would you rather stay here?" Kirux asked him, her eyes hinting slight energy. She liked moving around. Her first choice was to fly to the Marketplace, however, Inarius did not possess wings. She figured walking or running could work just as well. Her fingers laced theirselves around the handle, and she pulled it open gently, and a guard came to the door immediately, opening it for her. She nodded to him in thanks before turning to her guest, awaiting his decision. Watching her as she seemed slightly more relaxed and noticed her eyes flicker away and back to him he could tell by suddle things that she was more comfortable. Her wings were lossely folded and her posture had changed as well. As she said if he would like to join her or stay here he wasn't sure. He knew that she was going to ask her people but he wasn't sure if he would make them nervous or not. After all a leader from another world being in a conversation with a citizen could be intimidating especially with his demon attributes such as his slightly sharper canines. He didn't have to worry about his third eye though for he kept it covered under his head band. Inarius wanted to go to comfort the citizens just in case and he didn't want to be rude so he said. "If you don't mind I'll go, maybe I'll be able to help them get more comfortable with the idea." He said standing up putting on his jacket. Well, since your gonna fly you don't mind me running do you? Inarius said looking at her emerald eyes. He had never met someone he was so comfortable around. He was usually 'accompanied' by creatures that wanted to kill him. And it wasn't really accompany it was more of surrounded, if you understood what he was thinking. As the gaurd opened the door, Inarius quickly finished putting on his jacket so if the gaurd was lucky he would only see a small portion of the scar. As he followed Kirux he said "If you want to eat anything while we're there I have the money so it'll be my treat." He said pulling out a wallet with a dark blue "I" on it. He gave a small smile while following her. "Don't worry, I won't cause trouble" Inarius said to the guard reassuring him. During war you could never be to careful. Kirux shrugged, stretching her wings slightly, the ebony feathers ruffling against the door frame and the floor. If he wanted to run, she had to make sure to keep a calmer pace. A race would be highly one-sided with her flight. The female turned and passed through the door, where she came back into the largly open room, the glass dome above refracting the remaining light in the room brilliantly. The pale white walls nearly gave off their own bluish glow that mingled with the orange sunset. Arshtat was a truely beautiful city. "I'm glad you can join. Let's catch some people before it gets too late." Kirux signaled to the guard that he may go, as his shift there was about over. They weren't just mindless drones, they had families of their own. The Shining Light respected her people in all their efforts to keep the place together. She often preferred that they call her by Kirux, instead of the Queen, or The Shining Light. It all seemed too formal, when, without her people, she wouldn't stand for anything. The guard returned the nod in thanks, and walked to the front of the room, where a small door could be seen on the right. Kirux turned in the opposite direction, to the two double doors where Inarius first entered. She pushed the doors open gently, and waited for Inarius to follow through before she shut them once more, and waved her hand over a metal bracket in the front. A sharp string of light emitted from her hand and through the seam where the two doors met. Numerous sounds of locks clicked together within the door. With a slightly satisified smile, Kirux spun on her heel and walked down the left hallway, and continued following the path to the entrance. There were many random doors and hallways that branched off this large one, but few who lived here actually knew what purpose each door held within it. The large lighting at the ceiling was extremely unique, where it extracted sunlight from the air, and radiated it into this room. Holographic clouds were shifting with a faint wind on the ceiling, painted it hues from red to yellow, pink to gold. Just at the end of the hallway, two large stone doors were engraved and decorated elaborately, signaling the entrance. With another brief wave of her hand, the doors creaked and glowed a bluish tint, before opening slowly. The sunset's warmth rushed through, the breeze causing her long hair to shift lightly around her waist. Kirux smiled at the beauty of her city, and passed through the doors, stretching her wings to their full span at 12' across. With a slight yawn, she folded them, not as tightly as before, but so they weren't taking up so much space, and she turned to Inarius. "If you'd follow me, I'll guide you right to the correct location. Afterwards, maybe I'll take you up on something to eat. The people always appreciate us eating at their store. Supposively, it helps with business." The Shining Light giggled slightly with a small shrug, and turned, heading towards the long line of steps. To either side of the stair case, there were stone walls, which contained the people on the front porch-like area from accidentally falling the distance to the city ground. Kirux hopped up onto the stone slab, and looked back at Inarius, ruffling her feathers. "You can take the steps if you would like, I can meet you at the bottom." With a smirk the queen fell off the side in a graceful dive, and built up speed as she aimed for the ground below. Within a few feet, she stretched her wings to their full extent, shifting her weight backwards as she pulled to follow the ground horizontally. From their, she shifted around small obstacles that passed her by within inches. In moments, she reached the steps where she shifted to just hover, her ebony wings beating gently. A smile was shadowed by the angle of the sun, her back to it. Watching a shrug from Kirux and seeing her feathers ruffle, oviously a comment about the running remark. Even though this slightly confused him he didn't think much of it. In the room where he had originally saw Kirux. The room now had an indigo colored glow that was complimented by the ocher orange that was also emitting from the wall. He thought about how lucky she was to live in a world filled with beauty. His streets were usually dull due to the gray clouds that were alwaya above it even though it hardly ever rained. It was a dpressing place yet concealed by the mist that always lurked around the would. This gave the city cover which meant protection from being found as easily but this also scared some citizens during the night. That is why he took patrol during then since he was the strongest there, and as world leader he felt it his duty. "Sure let's go" Etzolix said. Kirux was lucky that guards were willing to work. He only had few and that was to watch the city during the day which was not for long because the 'day' was over when Inarius woke up. And as of letly he hadn't been getting as much sleep. But that didn't change his physical appearance, he was glad he could have a break though. As Inarius followed through the doors that opened he turned back to only watch them close as he left. Following Kirux through the hallway as she turned. As he continued to follow he looked up and saw clouds, only they weren't supposed to be there so he guessed it was a permanent Illusion, something that only machines were capable of. He believed an Illusion such as this were called a hologram. He then noticed all of the doors even though he doubted they all held a useful room. Some could just be decoys to confuse burglars just like what the egyptians did with their pharoahs tombs. It was a clever trick, probably a primitive version of Illusion. Well Illusion did come from deciet so you consider Illusion the new generation of deceit even though neither were 'new'. As he saw two large stones that were decorated in a style that light creatures were familiar with yet he was new to the decorations and they caught his interest temporarily. He new not to be to curious. "This was obviously the entrance" He thought to himself while turning to Kirux. As the door opened by a gesture of hers he saw the light radiate from the sun. He didn't look at it directly for that would be foolish he just saw it from a corner of his eye. He witnessed her expand her wings to their full length. They were at least ten feet in length. As she turned around after she had closed them She talked about taking him up on his offer. As she turned back around he saw a shrug and heard a giggle. She had a beautiful laugh but he would never say that. It wasn't like him to do such things. He saw her jump randomly and that weirdly surprised him. As she went down his decided to take the stairs casually, she was probably waiting for a while for he was walking at a normal pace. He wasn't the one to draw attention to himself. As he got off the final step he looked around for her but strangely he didnt see her. "Kirux?" The illusionist said asking where she was. "You didn't answer me though, do you want me to stay or would prefer a guard of mine to stay?" He asked. He knew that the boundaries had to be watched just incase. This way protection would last all night and the party would be completely safe. Etzolix wondered if she flew back up to see where he was. "Maybe I took to long?" Etzolix said to himself still wondering where she was.